This wonderful team is evolving and reaching for new horizons! Etsy is an amazing platform for web selling and developing a brand, yet the internet is widespread, and ripe for the taking. Our caterpillar of a group has come out of its chrysalis and is stretching its new wings. The International Beadweavers unite beaders across the globe, covering many linguistic, creative and historical territories. 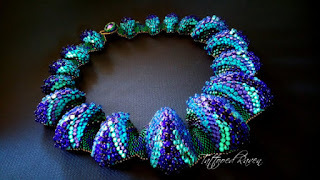 With challenges, activities, and soon, Embassies settled on various websites and social areas, we hope to bring a network of beading resources as well as web selling tips and tricks to our members, all the while bringing beadweaving as an art-form to the forefront of modern fashions. Formally, we were focused on acquiring success on Etsy, but now our goal is to come together as beadweavers, no matter which online selling platform we prefer. Thank you to everyone who has founded, elevated, participated and made the Etsy BeadWeavers the amazing team is has become. This is not an end, the next stage of life for our group begins now! 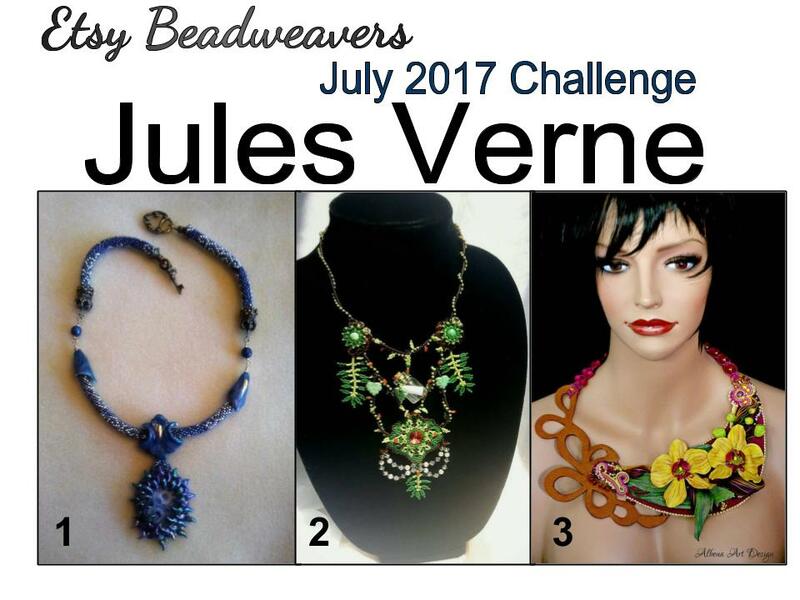 Congratulations to Elyse Turcotte of HumdrumAuguries who won both the team vote and the public vote with her Summer Statement necklace inspired by Jules Verne’s “L'île Mysterieuse.” There were three truly unique and striking designs created for this challenge. Here are the entries for this month's "Jules Verne" challenge! VOTING WILL BE OPEN FROM JULY 9TH UNTIL JULY 15TH. Please choose your favorite entry from the images or links below, then select your choice in the blog poll that will appear on the right sidebar during the days that voting is open. Click on the links below to learn more about each entry and see larger, detailed images of each piece. 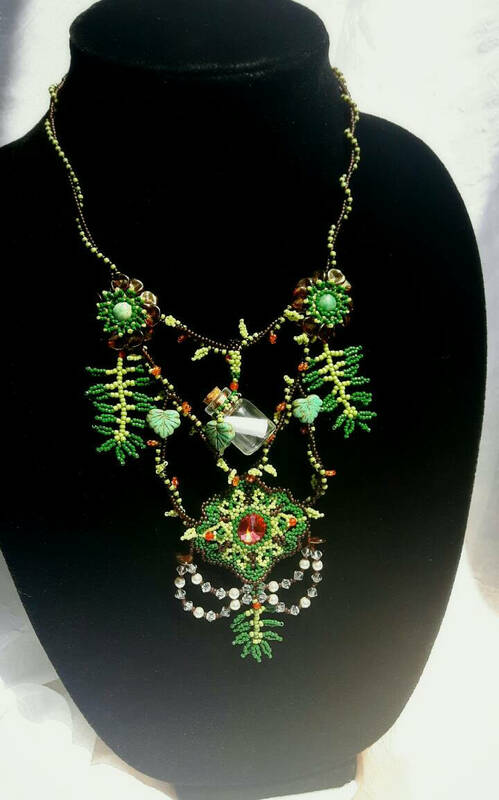 Congratulations to Raven Pena of Tatooedraven who took first place for the public vote and Albena Weibel of AlbenaArtDesign who won the team vote! 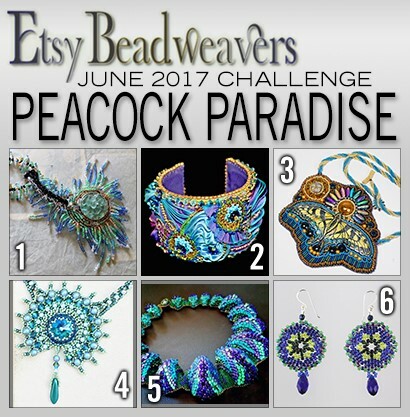 Here are the entries for this month's "Peacock Paradise" challenge! VOTING WILL BE OPEN FROM JUNE 9TH UNTIL JUNE 15. Please choose your favorite entry from the images or links below, then select your choice in the blog poll that will appear on the right sidebar during the days that voting is open. You seem to have a real passion for beadweaving and bead embroidery. What first brought you to the world of beading? My mother's good friend and art-therapist, Berthy Bijlard, introduced me to beads and cross-stitching when I was about 14 or so. I continued to do cross-stitching because it was easy to find that material. 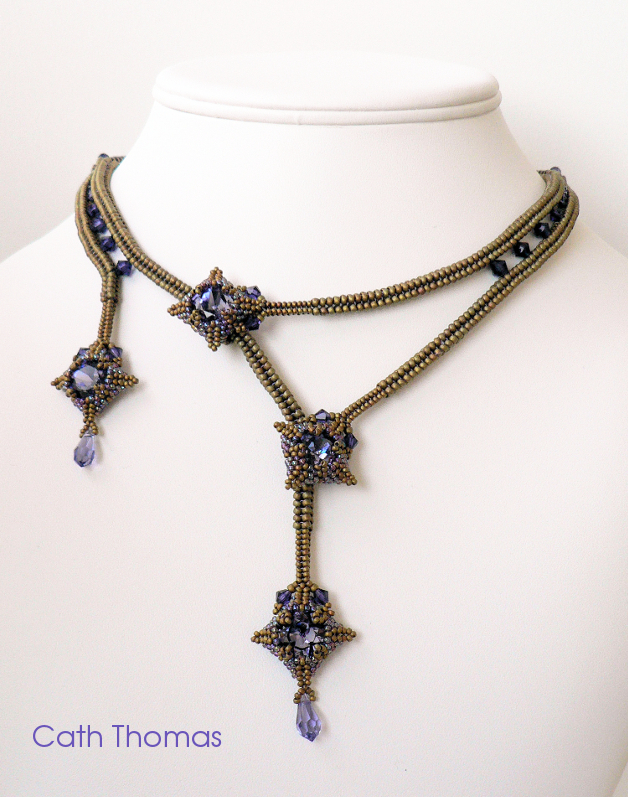 Only as an adult, I got comptelely hooked on beadweaving with seed beads and bead embroidery. 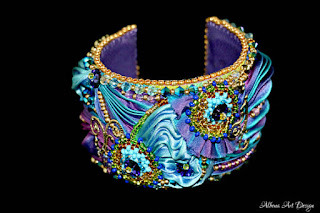 That was in 2004, when I saw the beautiful Bead Dreams contest pieces. Before I even could buy beads, I drew my own "Dream piece", and searched the web to learn everything from the materials to all the techniques. Where I am living there was nobody doing this, no shops, no workshops, nothing. There was also no translation for these things in French either. Eventually, I learned the basics and evolved by learning to solve problems by myself. Neytiri's - Scored 1st place in the FMG seed bead beading contest 2016 "Bib and collar style" category. I understand you are a bit of an expert at Diamond Weave. You even wrote a book in collaboration with the inventor of the stitch. Is this your favorite stitch? All stitches have their advantages and for that, I love them all. However, some please me more than others. 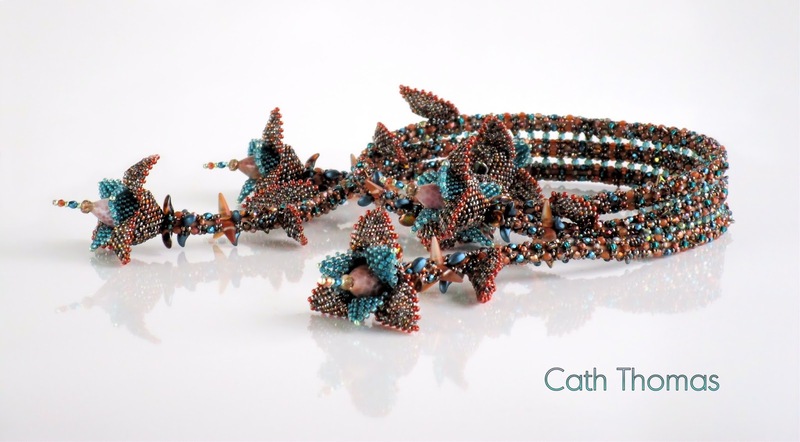 If I had to choose only one stitch to bead with, I'd have a hard time chosing between Peyote stitch, my first & much loved stitch, and Diamond Weave. There is so much one can do with DW and still so much to discover with it. 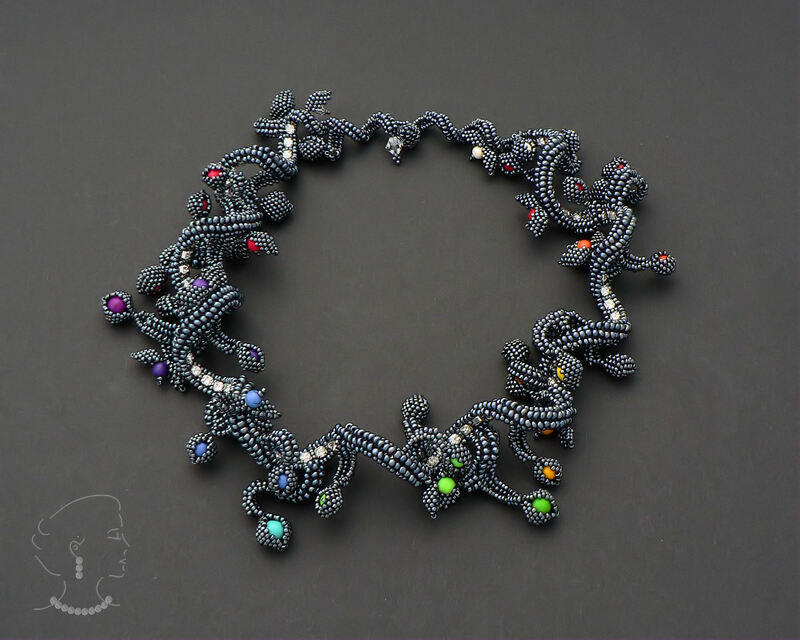 What are your favorite subjects when designing your pieces? You seem to draw inspiration from both the natural and geometric worlds. Mother Nature and Geometrics are indeed my main inspiration. My left brain is the control freak attraceted by geometrics and my right brain is a poet in love with nature's splendor and all living beings. I try to marry the two of them, which is much harder than you may think. 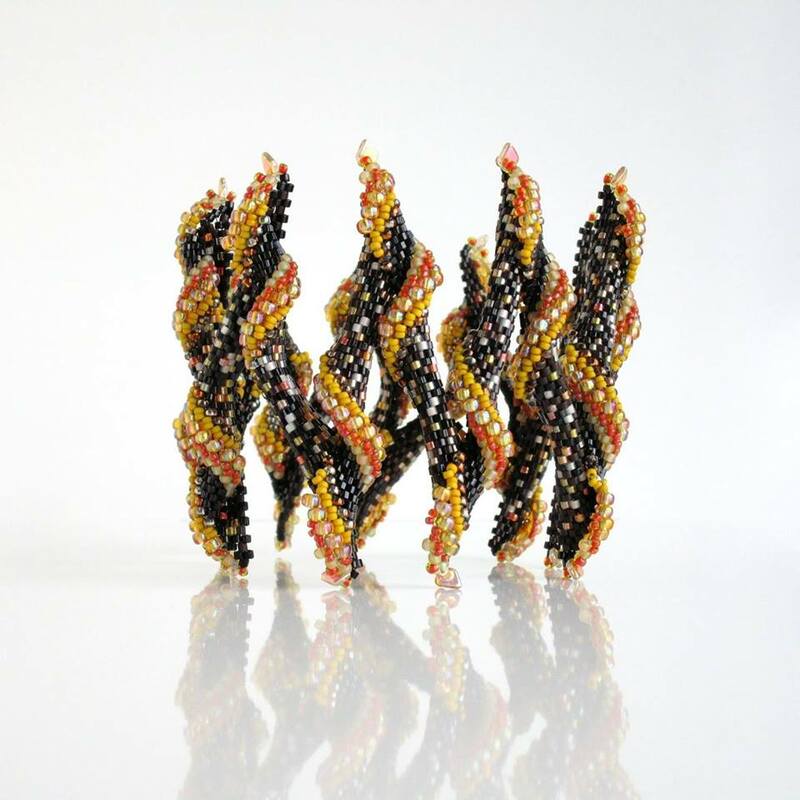 I essentially want to speak with beads (because I like to tell stories) in a way that blends geometric and organic, like the flaming cuff Embers, or the leaf that can be seen in my necklace "The Leaf" created in negative space thanks to the little Trapezino bezels. 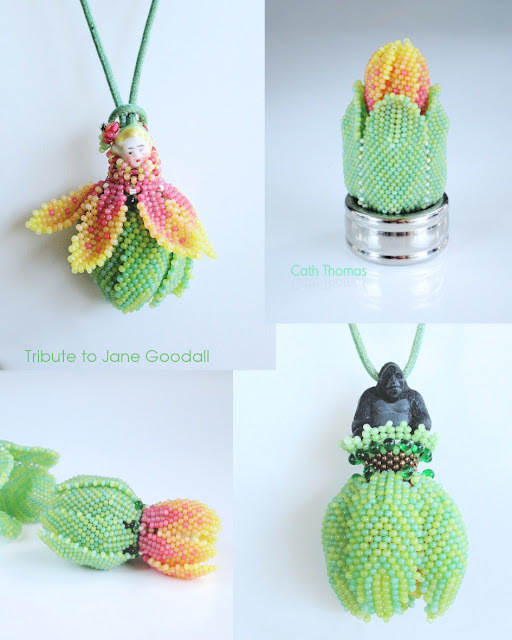 I am also quite happy with my petal to pod creations, like Neytiri's and a piece made for a charity, the Jane Goodall Pendant. I also like bead embroidery for it allows the use of a variety of non-beady materials which can also be very inspiring, like the images, metal stamps and perfume bottle used in "Seduction". What made you move on from beading to selling and finally teaching and tutorial writing? In 2006, I subscribed to a francophone forum. It appeared that in the seed beads section there wasn't as much to learn as I hoped, but that I had knowledge to transmit. I was particularly active in the hints and tips section, which resulted in some beaders calling me the "MacGyver" of beading (LOL!). I didn't sell patterns back then, I just wrote simple tuts and shared them for free, which allowed me to learn how to use software to explain things. I wish that tutorials for tutorial writing had been available back then, but I developed my own style, which imho is not so bad. The first pattern that I wrote "for sale" in 2009 was in fact a complimentary pattern I sent to each person donating for charity when the Fukushima disaster happened. Only when I had to stop working for health reasons and my income dropped significantly, I decided to sell tuts to pay for beady supplies. 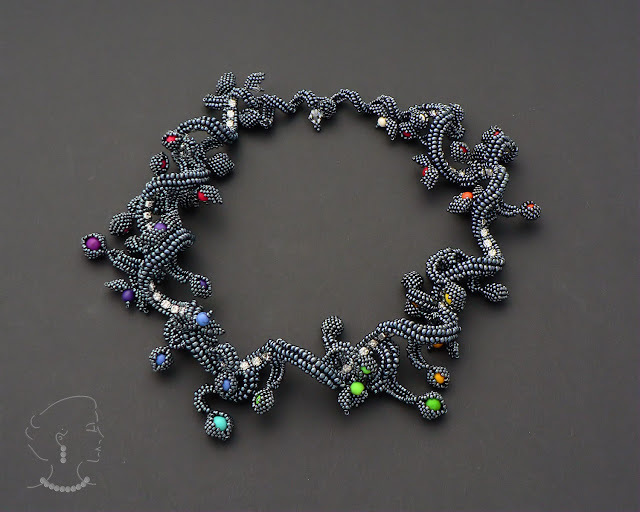 Your piece "Souls" is incredible (and I must admit, the tutorial is on my wish list!) 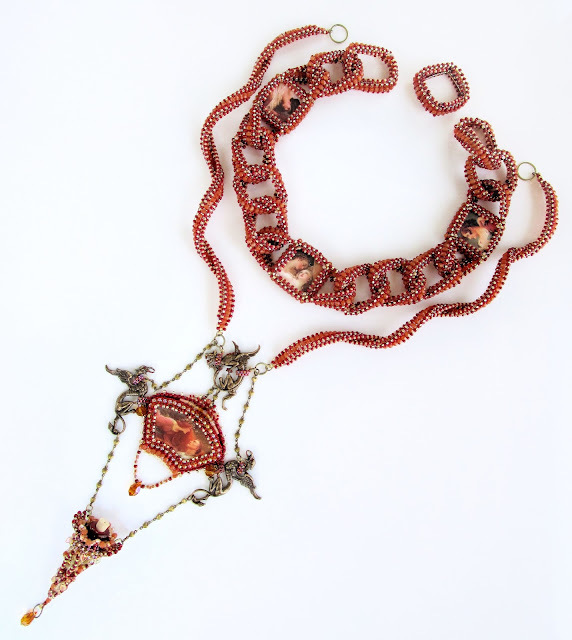 You describe it as the most mindful pieces you've ever beaded; can you tell us a bit more? Thank you! Souls is very special. It is an allegory of the walk of life or lives, and one of my first 'petal to pod' creations. I think that my left and right brain did a great job together. It tells the story of souls, which never die, but go through stages of development. I made pods with a rainbow of colors on the inside. A soul is in a body like a seed resides in a pod, and gets liberated when time has come. The colors are the chakras we have in us, like a rainbow, a stairway to heaven. Here and there a soul falls out of its pod, sometimes it is too much in the green or blue or red zone... Each color is of equivalent importance. To become enlightened, every step needs to be made, experienced. 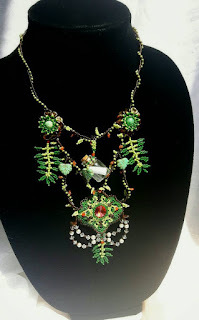 Therefor necklace has a very organic look, curling, moving, making tours and detours. The soul which has experienced everything and evolved to a miraculous level of consciousness has not one specific color, it has them all. Pure light is made of all colors, not none. The crystals at the far end of the necklace represent boddhisatvas, the enlightened. And finally, on the inside of the necklace, there is a long 'diamond' (cupchain) path, that cannot always be seen. Things may sometimes seem to go awfully wrong, but whatever happens, wherever you are, the walk is paved with diamonds. They are not always visible, but they are there, all the way long, all the time, at every step. Because life is glorious. Where do you prefer to do your beadwork? Anywhere in a calm place, in a good chair with arm rests near a window, but not in the sun. I would love to bead outside, or in public, but my light sensitivity prevents me from doing that. Tribute to Jane Goodall - A double-sided pendant / Sculpture / Toy - The doll's skirt protects the gorilla. I understand that you blog about your beading adventures. 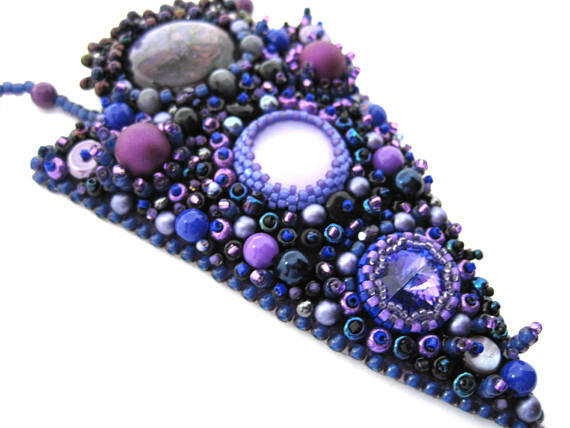 Does writing about your beadwork help the creation process? No, the creation process results in writing about it, in particular if it was a long or special work. 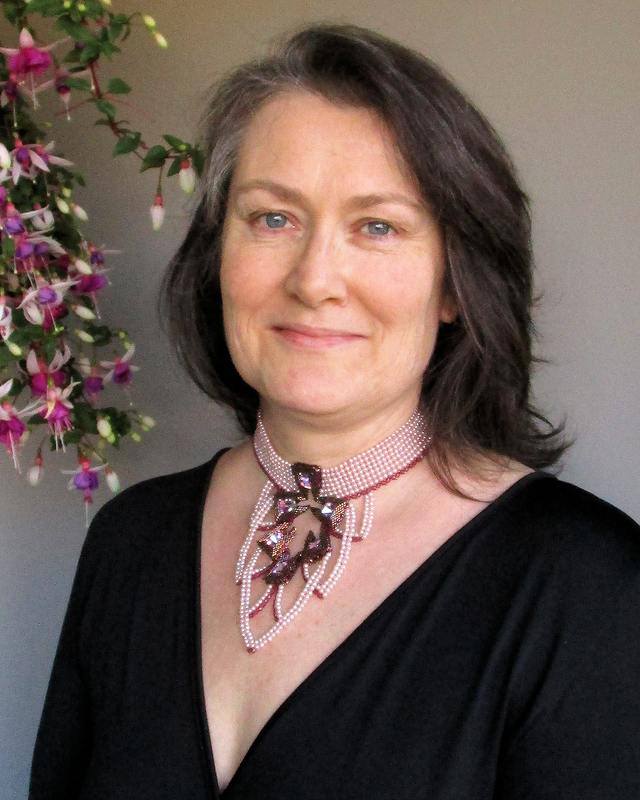 I like to share my experience with other people who would like to learn about it as much as I like to read about the WIP of other beaders, like Marsha Wiest-Hines. 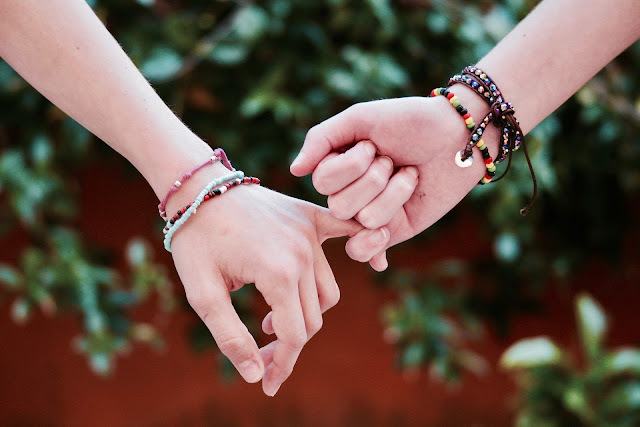 This is how we can learn from one another despite the distance between us. It is also a way to tell people what they can do with what I teach in my tutorials if they take the step of exploring further and improvise. and maybe that is what makes my beading a successful journey. Congratulations to Sandra Allen of Bliss Works Studio who won both the team and the public vote!